Card Effect(s) [AUTO](VC/RC):[Counter Blast (1)-card with "Duo" in its card name] When this unit's attack hits a vanguard, if you have a «Bermuda Triangle» vanguard, you may pay the cost. If you do, choose one of your other «Bermuda Triangle» rear-guards, return it to your hand, search your deck for up to one card with the same name as that unit, reveal it to your opponent, put it into your hand, and shuffle your deck. 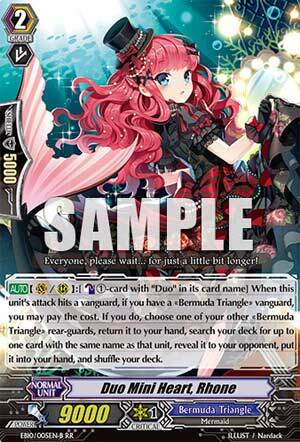 [AUTO](VC/RC):[Counter Blast (1)-card with "Duo" in its card name] When this unit's attack hits a vanguard, if you have a «Bermuda Triangle» vanguard, you may pay the cost. If you do, choose one of your other «Bermuda Triangle» rear-guards, return it to your hand, search your deck for up to one card with the same name as that unit, reveal it to your opponent, put it into your hand, and shuffle your deck. ...for the Duos, Rhone really helps out in the facts of not just adding to your hand size but to also thin the deck out and helping improve trigger ratios and probabilities. That and a lot of the Duos effects rely on having them being bounced back to the hand anyway, so it helps out even more by that standard by utilizing their skills through Rhone. The only drawback I can think of is that you need to Especial Counterblast a Duo, but aside from that, this is an excellent card to have in the Duos deck. It's a Grade 2 this time. and all because any other Grade 3 Bermudas I could review means digging through the box topper promos, yay! Anyway. This Rhone chick can, for a CB cost of 1 Duo, bounce a unit back when she hits a Vanguard, search for another copy of it from the deck, and add it to the hand. That's pretty cool. On the VG circle, she should be at a point where no-one will guard her anyway, so you could do the aforementioned combo of adding more Perfect Guards to your hand guilt free. Anywhere else, she can extend pressure to your columns, so she works brilliantly with anything that can either smack the opponent around in the middle or late in the game (such as tomorrow's card, yuk yuk) for all that guard eating. Rhone is a neat card. Glad this set actually gave Bermudas something GOOD.